The Coyotes hung with rival South Dakota State University throughout this past weekend’s game, but a missed opportunity to take the lead and a late interception would seal the game for the Jackrabbits. Despite the Coyotes’ best efforts, they fell 21-28. “Our goal was to win the football game and credit our guys for taking the game to the end and battling like crazy, but you know obviously falling short of the ultimate goal is very disappointing,” said Coyote head coach Bob Nielson. Streveler led both teams in passing with 217 yards and two touchdowns, along with an interception. He also was USD’s leading rusher with 66-yards and a touchdown. While the two teams were nearly equal in passing yards, 217 to 215, the difference in the game was in rushing. The Jackrabbits totaled 415-yards on the ground to the Coyotes 136. USD struggled to stop the SDSU ground attack as two Jackrabbits would rush for more than 100 yards. Brady Mengarelli and Isaac Wallace would go for 161 yards and 102 yards respectively, while Christion and Kyle Paris would run for 79 yards and 74 yards. The Coyotes now switch gears as they prepare to take on North Dakota State. The Bison are currently ranked third in the FCS Top 25 and are coming off of five consecutive national titles. Despite NDSU’s impressive resume, the Coyotes are quick to recall last year’s trip to Fargo in which they defeated the Bison on a last second kick from now senior kicker Miles Bergner. USD is looking to play NDSU like they’ve played every team they’ve faced this year, but the Bison’s talent isn’t lost on them. For the Coyote seniors, this game marks the end of their journey at USD. Even though the seniors may be moving on, they have helped lead the Coyotes in a transition from a team that failed to win a single conference game in 2014, to a team that is knocking on the door of their first playoff berth. For Bouma the four years have flown by and he is grateful for his time at USD. 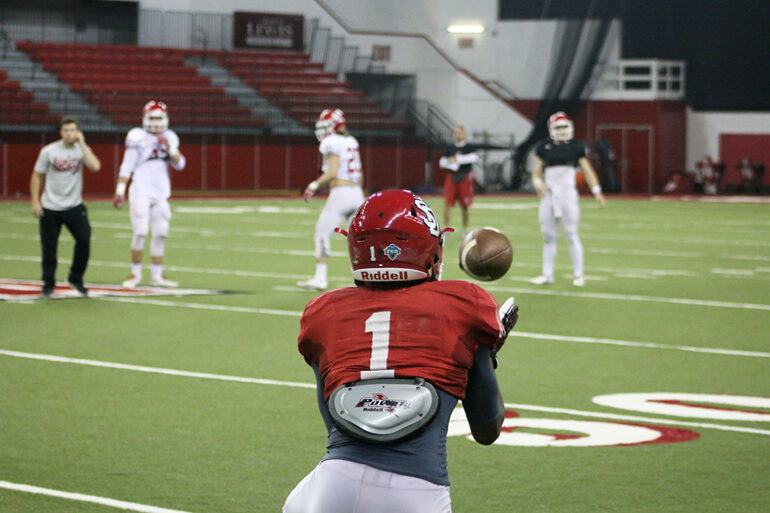 As a senior, Bergner has watched the team grow into something more over his time in Vermillion. For guys who will be back next year like Streveler, the impending end to this season just marks the beginning of the next. “I’m going to be hungry after the season ends to get right back after it and keep working because I know how good we can be and I know how close we were this season to potentially getting in the playoffs, a couple games here and there but sometimes it doesn’t work out and I’m excited to get back after it,” Streveler said. With the loss to SDSU the Coyotes dropped to 3-4 in Missouri Valley play and 4-6 on the season. Kickoff time for this Saturday’s game is set for 2 p.m.